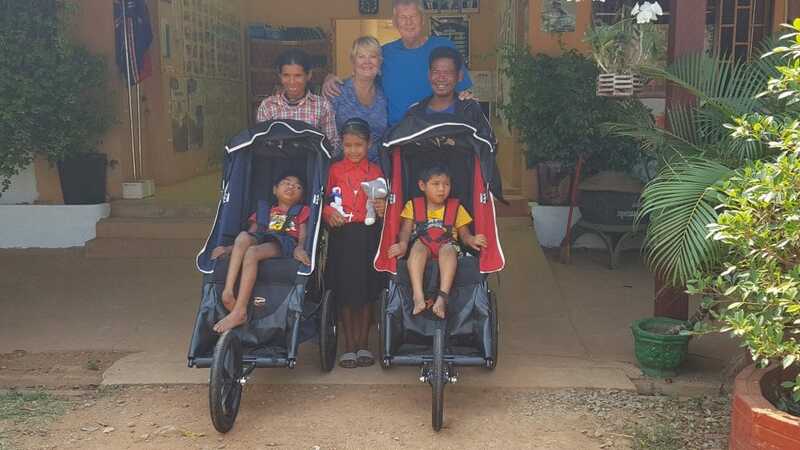 Carolyne and I hope all your ears were burning at 10.30 est on Thursday evening, because that’s when we handed the wheelchairs over to Seiha, Sil and their parents on Friday morning at 10.30, here in Cambodia. At first both children were frightened and didn’t want to be strapped in, so we just sat them in and pushed them around this big room we were in. Once we’d done that, for all of 30 seconds, there were no problems, as you can see from the photos. The parents were extremely grateful, Dad was even crying with joy. The wheelchairs will transform the lives of the family as they’ll no longer have to carry the kids around. Phyllis/Teri if you’re going to open a new foreign market, I could probably get a couple of kids to demonstrate the products for you. Seriously, on behalf of World Vision Koh Krolor, Seiha, Sil, Maly (their sister), their parents, and Carolyne and I, a heartfelt thanks. We know it wasn’t easy, and we made a big ask, but we hope, that like us, you think it was all worthwhile.